The full-tray of tofu and rice noodles filled with sumptuous toppings, fused together with shrimp paste is bound to blow away your tastes. 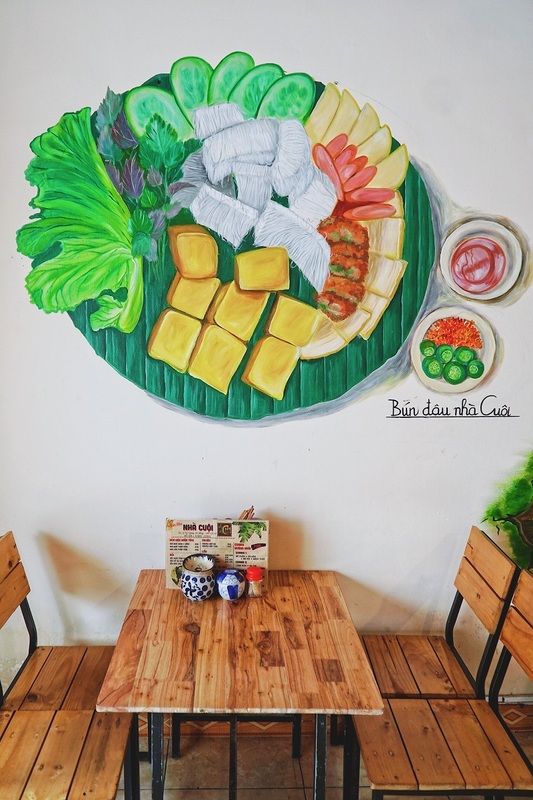 Been in business for more than 3 year, Bun dau Nha Cuoi, with high quality and reliable taste, has become the place to go for food lovers in Danang. 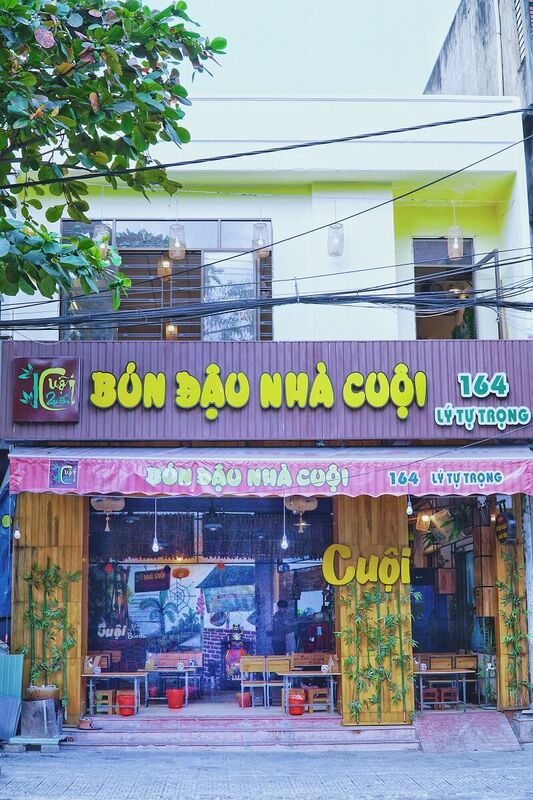 Located 167 Ly Tu Trong St., Nha Cuoi gives guests a gentle and homey impression just as the name suggests (Cuoi’s home). The establishment is spacious with 2 stories decorated with smart design corners: graffiti of old Hanoi streets, cute portraits of Cuoi, depictions of country fields… Everything here reminds you of the peaceful landscape of the northern countryside villages..
Apart from the delicate touch in interior design, what picks Nha Cuoi out from the rest is the unmistakable taste of the tofu and rice noodles served with shrimp paste – a distinguished dish that can hardly be found elsewhere. 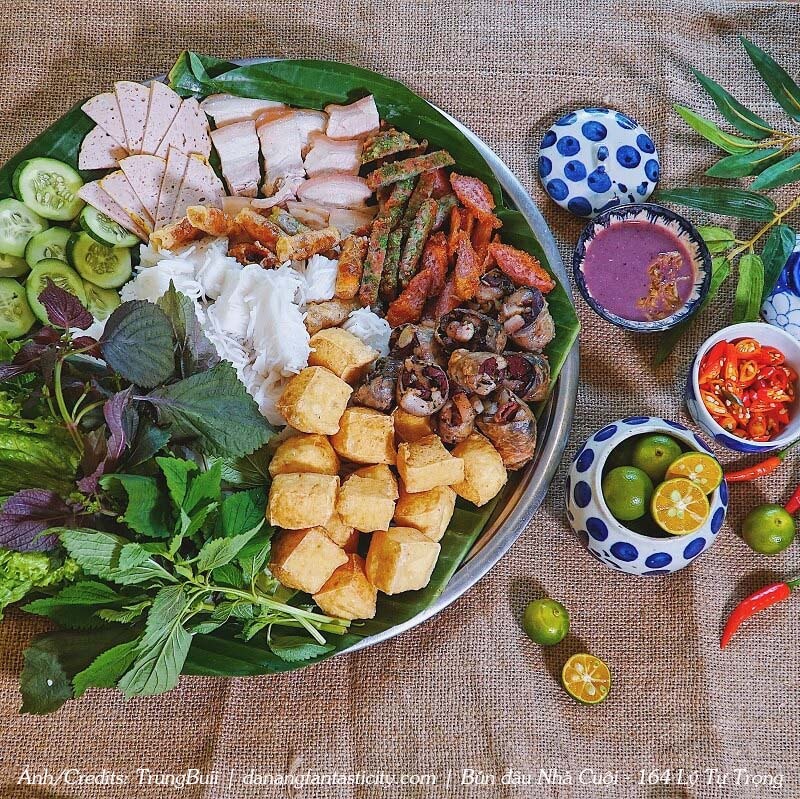 The first bonus for Nha Cuoi is the ‘massive’ portion with all kinds of ‘mouth-watering’ toppings. 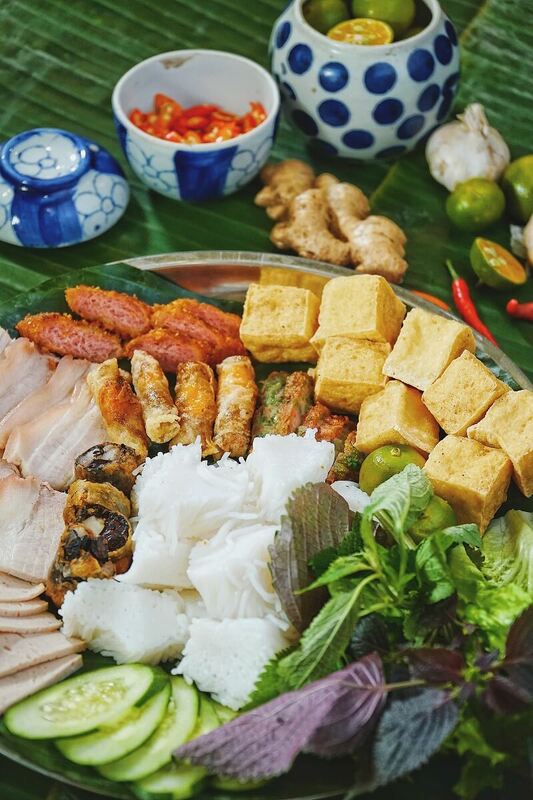 Tofu and rice noodles with shrimp paste here is served with 10 exquisite ingredients: chopped pork, fried pork, pork pudding, deep fried tofu, steamed sliced pork, spring rolls, cucumber slices and herb leaves (perilla, lettuce…). Each and every single ingredient was carefully picked, sourced freshly daily, cooked with chef’s passion. So, no worries about the quality of taste here – everything is fresh and tasty. The tray when served is always steamy hot. The rice noodles are always ‘fresh, straight from oven’ regardless of day or night. The boiled pork slices are wonderfully melting in your mouth. 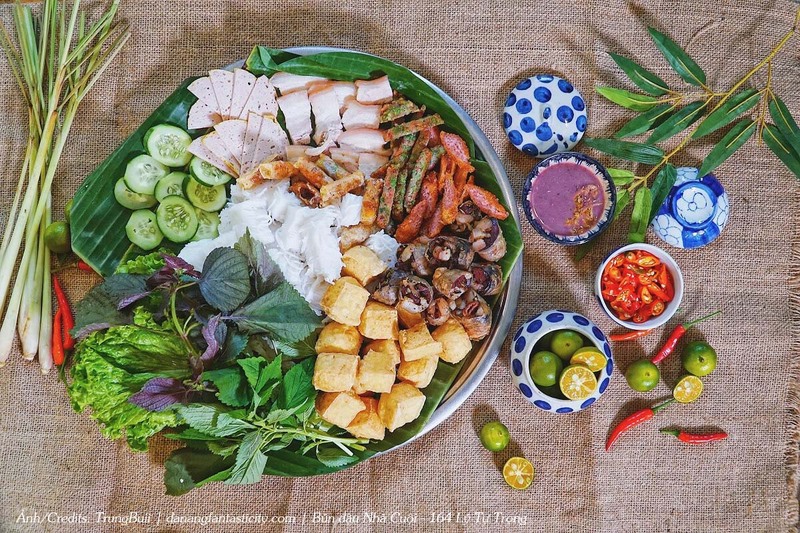 Grilled pork is also sourced from one of the best known producers in Danang. The tofu which is used here was thick and densed. Even the frying phrase is done with great care so as to leave a crunchy crust outside but keep a silky soft texture inside. 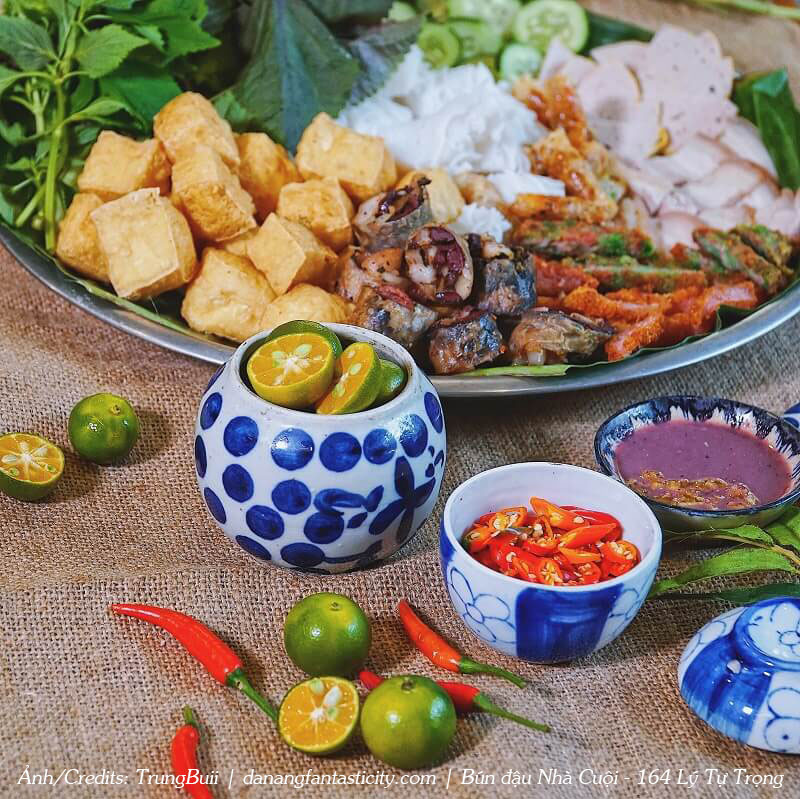 To reach perfection of taste, grilled pork and fried grilled pork are also sourced all the way from Hanoi. 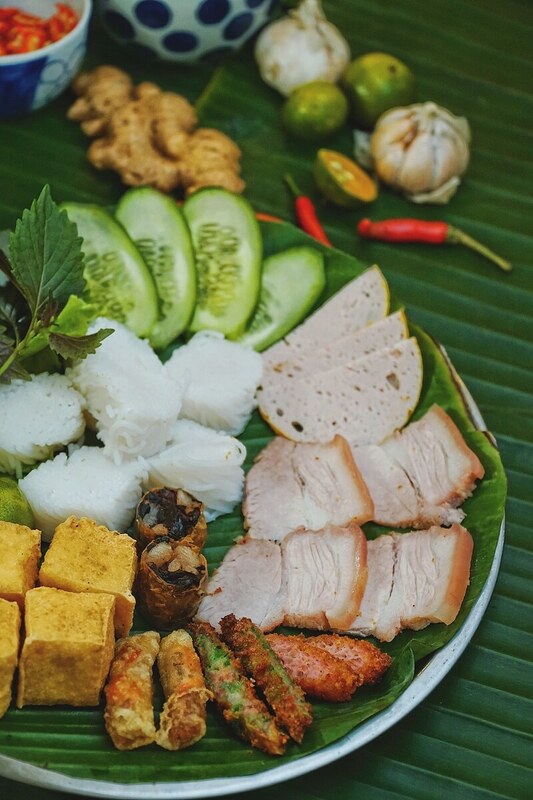 The chewey grilled pork with sticky rice was extremely well-known specialty from Vong village. The fried grilled pork coming out in crunchy bites is also the favorite for many guests. The most sense-arousing component must be the well-seasoned pork pudding. Upon taking a bite you will get to taste the crunchy chewy crust, then a fusion of flavors: pepper, chilly, herbs…which even the hardest guest would have to bow to. 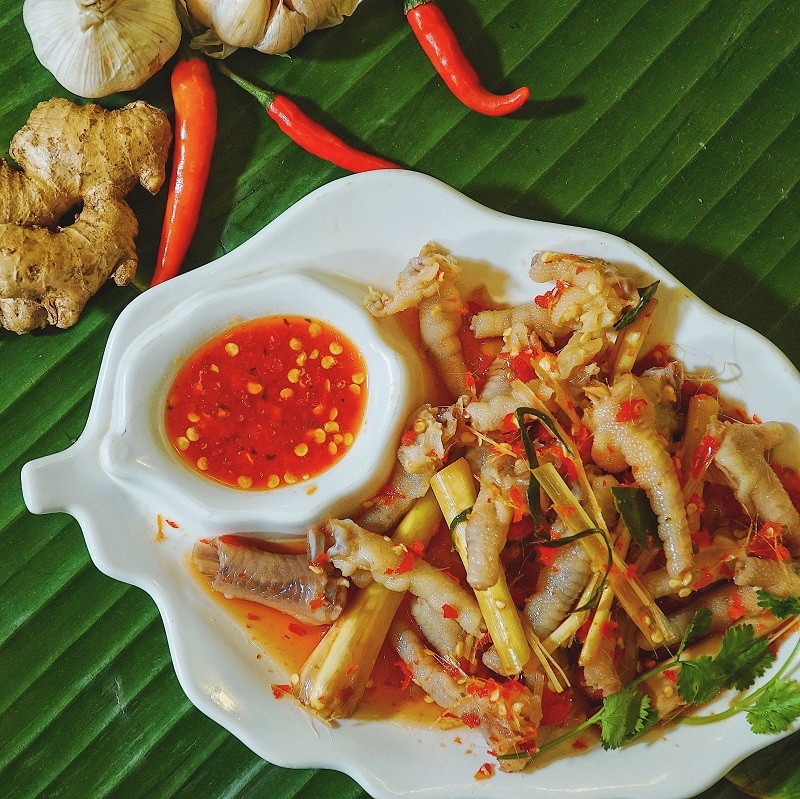 Lastly, the most important ‘weapon’ of this specialty is the shrimp paste. The shrimp paste at Nha Cuoi is delicate, aromatic yet never too strong. On the surface is a slant layer of lard upon which the gourmet would judge the dish for being ‘authentically Hanoi’. Can you believe it? To get the right shrimp paste it takes a great secret procedure! You’d need to squeeze in a bit of kumquat, stir the paste for it to bubble up. Up next you’d need to add some hot chilly slices, add a bit more shrimp paste for a rounder taste. Now it’s ready! Stop waiting around and ‘get into’ it right now! The tofu and rice noodles tray at Nha Cuoi is also appealing price-wise: a small mixed tray is only at 29k, big mixed tray only 49k. Exclusively, foodies must not miss the 99k mega tray food challenge! All the side ingredients you can order more as you like. 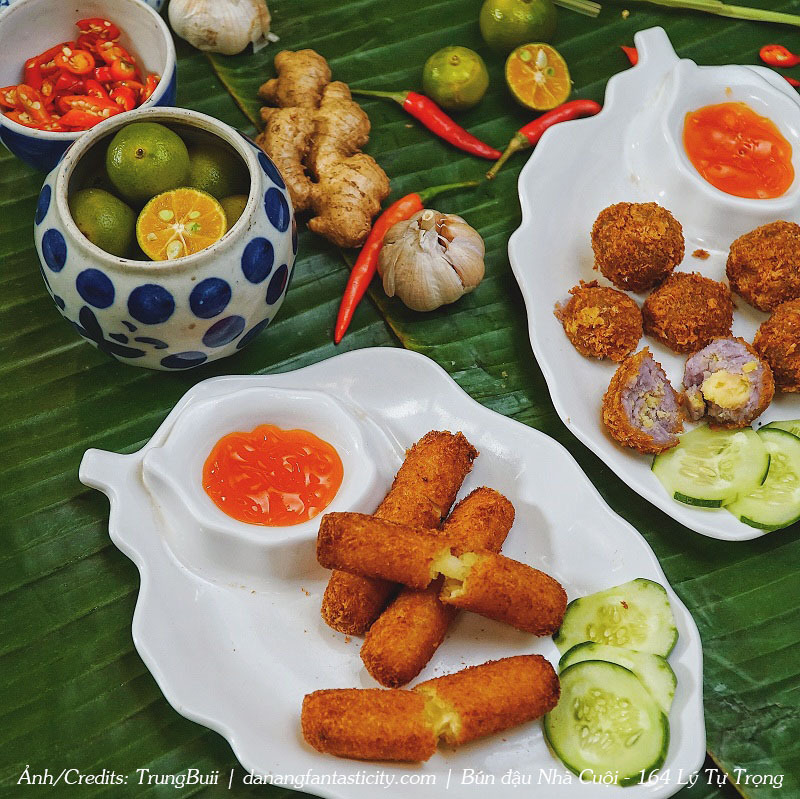 Apart from the famous tofu and rice noodles with shrimp paste dish, Nha Cuoi also offer a wide variety of street eats: fried taro balls, cheese sticks, chicken nuggets, fried shrimps, spicy octopus…from just 29k. Seasonal beverages which clench your thirst and give you vital elements, all made-at-Nha Cuoi: cold 10-herbal drink, apricot juice, black berry juice, Atiso flower juice…will make your meal even more tasty. 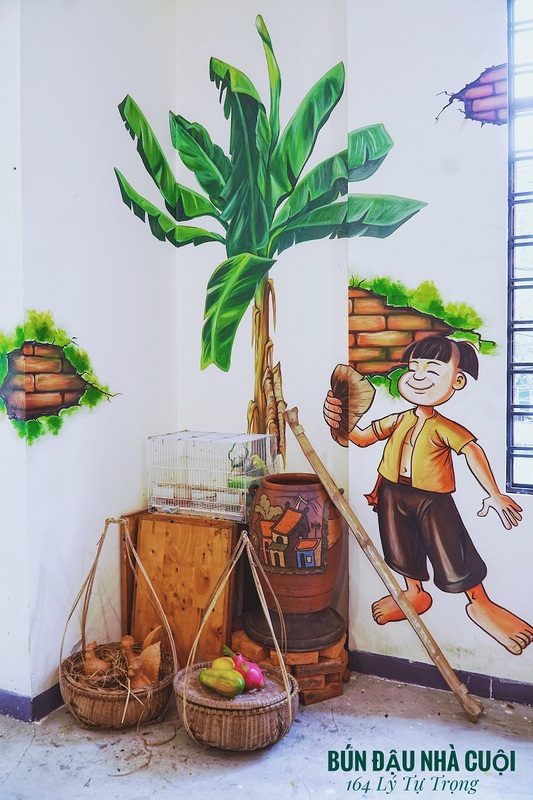 The cozy decoration with many fun check-in spots for photos, the distinct shrimp paste taste ‘authentically Hanoi’ are why you should visit Nha Cuoi now and what make sure you will visit Nha Cuoi again.